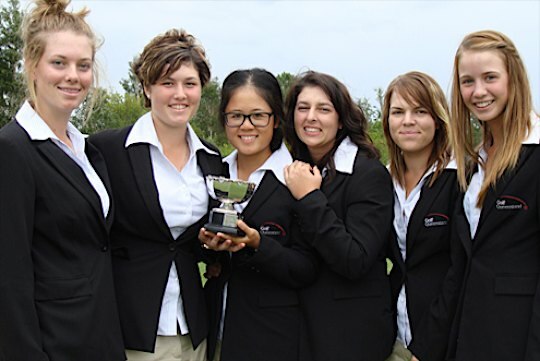 Queensland has won the Burtta Cheney Cup, claiming their fourth win in six years at the Australian Girls’ Interstate Teams Matches at Pacific Dunes Golf Club near Newcastle. With the result beyond doubt after yesterday’s play, the Queensland team could afford to enjoy their morning bye and soak up the victory. Queensland finished even on contests (3) with second-placed Western Australia but won by 1 ½ matches. Royal Queensland member Christina Mew was undefeated for the championship. Her winning Queensland team mates included Jaimee Dougan (Beaudesert), Zoe Field (City), Gennai Goodwin (Mossman), Lauren Mason (Horton Park) and Emily McLennan (Hills). Western Australia defeated South Australia 4 ½ to ½ this morning to confirm second place with Hayley Bettencourt (Mandurah) and Whitney Harvey (Melville Glades) also undefeated. In the other contest, New South Wales triumphed 3 ½ to 1 ½ over Victoria to finish third with recently crowned Australian Girls’ Amateur champion Cathleen Santoso (NSW) defeating Victoria’s Montana Strauss 4&3 in the number one match. Victoria and South Australia finished in fourth and fifth place respectively. The Queensland girls have had extraordinary dominance in the championship since it began in 1986 for the Burtta Cheney Cup. They have won the title 15 times since 1990.